Bentley Organic Calming and Moisturising Hand Wash 250ml keeps hands clean and soft with natural oils like Jojoba and Aloe Vera. 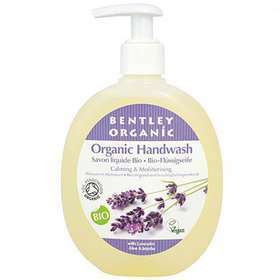 Bentleys Hand Wash has a natural lavender scent to help relax you whilst washing hands. Contains Aloe vera and lavender oils. Apply desired amount to your hands and scrub clean. Avoid contact with eyes, if this occurs rinse thoroughly with water. Aqua, potassium oleate, potassium cocoate, glycerin, sodium chloride, lavandula angustifolia (lavender)oil, simmondsia chinensis (jojoba) oil, aloe barbadensis leaf juice powder, linalool, potassium citrate, citric acid.